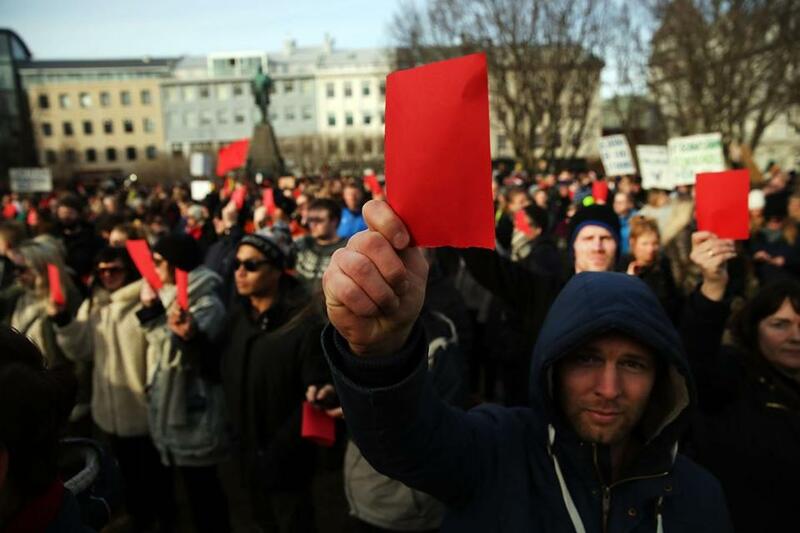 Hundreds of protesters gathered on Thursday in front of Parliament in Reykjavik, Iceland. Prime Minister Sigmundur David Gunnlaugsson stepped down after news broke that he hid his assets in an offshore shell-company. If you’re an American reading about the so-called Panama Papers, you might think: Good thing that’s not us. This past week, members of the International Consortium of Investigative Journalists reported on data leaked from Mossack Fonseca, a Panamanian law firm that created a vast quantity of shell companies. Reporters concluded that close friends of Russian leader Vladimir Putin had moved $2 billion around through secretive offshore entities; that the brother-in-law of China’s president, Xi Jinping, had two offshore companies chartered in the British Virgin Islands; that the families of those in power in countries from Azerbaijan to Saudi Arabia to Malaysia had used the firm to hold assets overseas. If the sheer number of regimes implicated in the Panama Papers is any guide, garish forms of corruption infect political systems around the world. To cynics, it’s an article of faith that politicians are on the take, even in democratic countries where elected officials are subject to the rule of law. So far, nothing in the Panama Papers supports that level of pessimism; as of Thursday afternoon, no American official’s name had surfaced in the scandal. Still, just because corruption here isn’t as bald as in, say, Azerbaijan doesn’t mean it doesn’t exist. The proceeds of global financial intrigue turn up in the United States in the form, for instance, of all-cash condominium sales in Miami, or in special trusts in Nevada, South Dakota, and Wyoming. The United States has emerged as a tax haven rivaling Panama, Bloomberg reported earlier this year, and is fighting international financial reporting standards developed by the Organization for Economic Cooperation and Development. That’s not because of popular demand among the American electorate. It’s because a regulation-averse financial sector and high-net-worth individuals prefer looser rules and wield considerable influence over the US political system. Deference to politically connected elites, tolerance of money from dodgy sources, the quiet subversion of government in ways that further narrow private agendas at the public expense: These forms of corruption survive even in advanced economies where getting rich while in elected office is considered a no-no. Leaving aside the occasional public official who’s caught stuffing bribes into his or her clothing, the United States and a relative few other countries have mostly passed the stage in their political development where elected leaders simply skim off cash. In the nonprofit Transparency International’s annual reports on public-sector corruption around the world, the cleanest 20 or so countries usually are located in northern Europe (think Denmark, Sweden, Finland) or are highly developed former British colonies (New Zealand, Canada, the United States). So it’s noteworthy that the first elected leader to fall after the data dump was the prime minister of Iceland, which ranks a lofty 13th on the most recent list. Sigmundur David Gunnlaugsson and his wife have been linked to an offshore corporation that held the bonds of troubled Icelandic banks. The Panama leak has also exposed connections between offshore companies and major European banks, the now-deceased father of British Prime Minister David Cameron, and — awkward! — the president of Transparency International’s branch in Chile. Then again, one key reason such officials can siphon off money is that there are accommodating lawyers, bankers, accountants, and real estate brokers in more respectable countries. The global tax-avoidance industry may not view dictators’ cronies as its primary customers, but those bad actors clearly benefit from its work. Once we’ve accepted that public officials shouldn’t walk off with burlap sacks full of cash, we should also be alert for other, less glaring ways in which government gets used for questionable private gains. If the United States breaks with the tax-avoidance industry and enacts tougher disclosure rules, the change won’t just frustrate kleptocrats on other shores; it’ll also fight subtler types of corruption on ours.